Romance is omnipresent on Santorini - one of the most beautiful islands of Greece and the Cyclades in particular, with its famous and often photographed flooded caldera in the light of a reddish sunset with a bell tower (campanile) or a blue or red cupola (church dome) on the foreground. 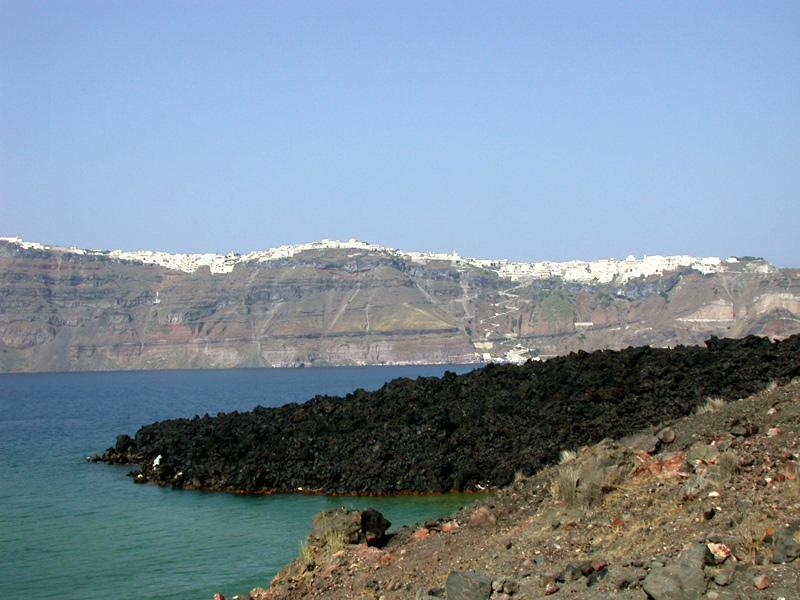 Indeed many of the cruises around Santorini are honeymoon cruises and often the Greek wedding itself is also arranged on Santorini or on one of the nearby islands in these Aegean waters of Greece. Although the weather in August can be rough, certainly compared to the more relaxed winds in the Dodecanese where more cruises on motorsailers and gulets are organised, the Cyclades make up for it by sheer natural beauty combined with picturesque ports and astonishing bays. Therefore many couples prefer to have their honeymoon cruises in the Santorini and Thira area instead, optionally starting from the yacht charter bases on Syros and Paros. And although these Greek honeymoon cruises are somewhat different than the archetypal blue voyages or blue cruises along the Turkish coasts near Bodrum and Marmaris, the motorsailers in this part of the Mediterranean are totally designed with luxury in mind, not only the quarters are very luxurious, with each cabin sporting an ensuite bathroom, the crew will tend to your every need with delicious gourmet cooking and all the pampering that Santorini honeymoon cruises make so very special. Other interesting ports to start from are Athens (to explore the Argolic and the Saronic) and Kos (to explore the Dodecanese). The most luxurious and fully crewed yacht charters for the romantic love birds can be found in either Bodrum, Mykonos, Santorini and Bodrum, see my guide on yacht charters for more details on the various sailing areas of the Aegean Sea – both Greece and Turkey. Archaeological sites such as Akrotiri and Delos (Dilos) can be alternated by turquoise blue bays with sandy beaches, and in the evening a delicious diner is served and cooked, which is specially prepared from local produced foods and freshly caught fish.